Our client was looking to create a kitchen that didn’t really look like a kitchen. 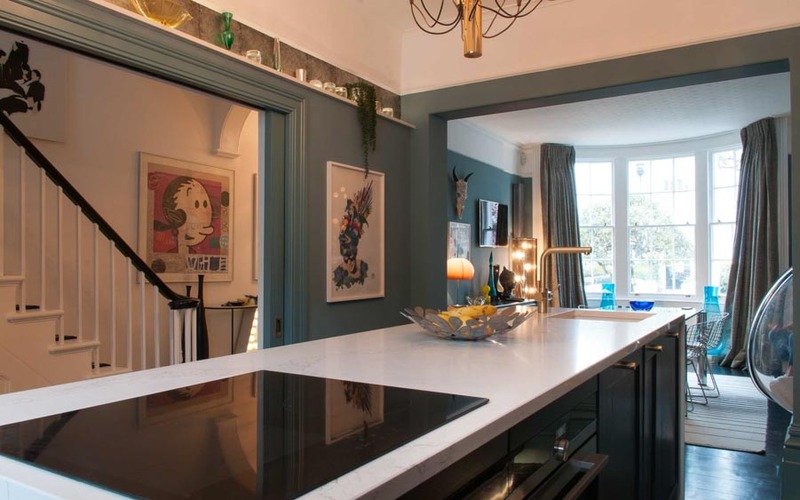 Set within a Grade II listed Brighton townhouse the kitchen was to be moved to the former dining room. The space would be open at one end to the lounge and on one side to the hallway. 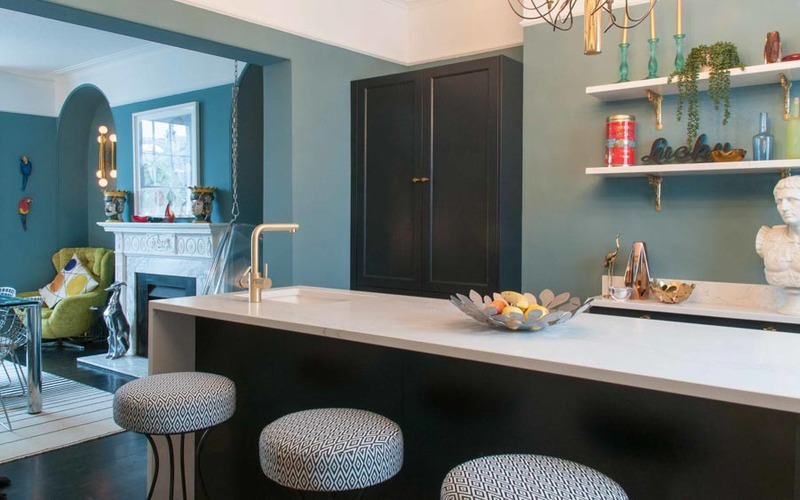 The idea was to incorporate all the features and functionality of a contemporary kitchen but have the finished kitchen look and feel more like furniture. 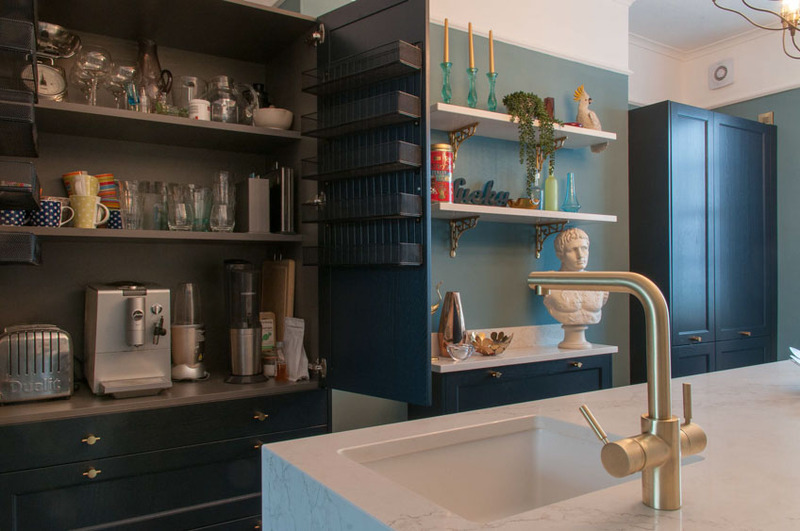 To further challenge us as designers, they wanted all the bells and whistles of a modern, luxurious kitchen, including boiling water tap, chefs pantry, island with seating and two ovens. Added to this the room was not particularly large! In a space like this the design starts with working through how all the functionality can be achieved. The two alcoves on either side of the chimney would house two blocks of tall units. On the left would be the pantry and, on the right, full-height refrigeration and a pull-out larder. Such was the demand for space we even used the chimney breast to house an extra drawer unit. In the pictures it only looks 20cm deep but it actually extends 40cm into the fireplace! The island not only had to look good but it had to work super hard, too. Housing both the sink and hob, two ovens, a bin, a dishwasher and seating for three. Once we’d ironed out the functionality it was a case of deciding on the finishes and the overall style. In this area our client was a real inspiration! Coming from a background in interior design there were a few times we had to “trust her” that it would work. 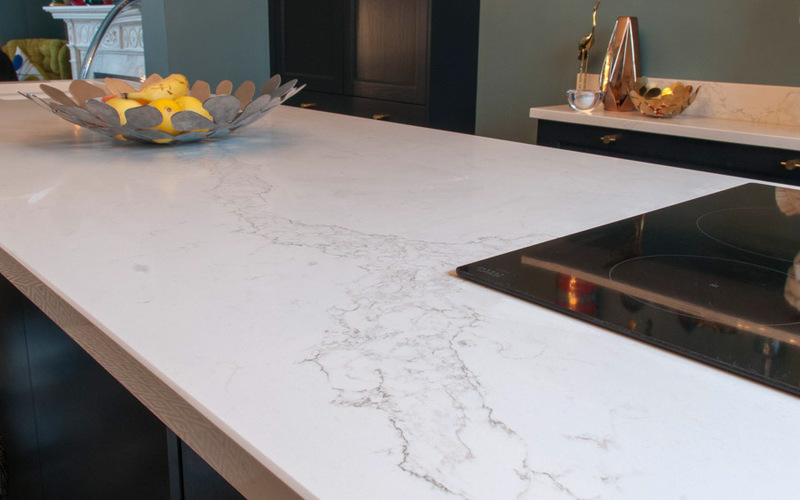 We kept our part as simple as we could, the island lavishly wrapped in marble effect Quartz and dark, sophisticated blue cabinetry. Not only was this kitchen project something of a departure from the minimalist handle-less, designs we usually work on, it was also one of the most fun and inspiring to be a part of. It is great for us as designers to be challenged, not just in terms of functionality, how do we possibly fit everything in! But also, in terms of our style, our client really lead the way here and in doing so, cliché as it maybe, she helped us to grow a little. The result is quite stunning, it’s eclectic for sure, and luxurious without doubt but there’s a warmth to the space that really makes it feel like a home. This is not the kind of ‘design by numbers’ you can easily teach, it’s born of a wonderful eye and a lifetime of experience. And for Black Rok, it’s a lesson that sometimes, just sometimes, the road less travelled is where the real magic lies. “We have been dealing with Jamie at Black Rok for the last 2 years as part of our house refurbishment programme. The entire project was complex as the house is Grade 2 listed and there was considerable red tape, particularly with the kitchen space, before we finally managed to reach a satisfactory outcome. Throughout the whole process Jamie has been unfailingly helpful and patient. 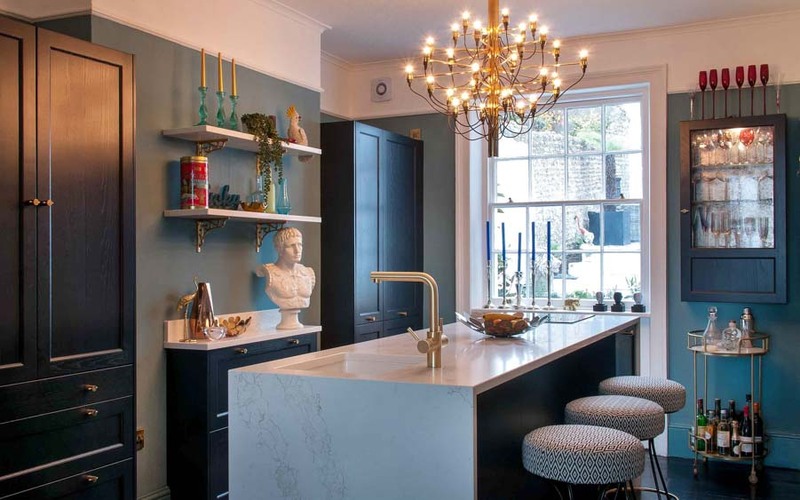 His ideas for what was a tricky space have been very creative, resulting in a fabulous kitchen that is functional, excellent quality and beautiful.